There is a right coffee mug for every occasion. In the morning, when you're having a rough start, a bigger portion may be needed. This is where you'll pull out the "emergency coffee mug", the one that seems to hold enough liquid energy to put a spring in your step. Sometimes you just need a little pick me up or a night cap, so a smaller cup is a better option. Use the tips here to help you find the right coffee mug for every occasion. Size. Most coffee cups hold roughly 10-ounces of coffee. This doesn't leave much room for sugar and cream if you choose to use it. A 10-ounce cup is considered to be a somewhat standard serving. Many diner coffee mugs are this size. These also store well as the mugs are not as large, so this size is ideal for gatherings and dinner parties. When it comes to personal preference, 12 to 14-ounces tends to be the desired size. This size is typically wider and heavier. Handle Type. The handle of a coffee mug is very important. It has to be comfortable to hold in your hand. Typically, a good rule to go by is that if you cannot fit three fingers in the handle, it will be uncomfortable. For some, holding both sides of the mug helps warm their hands in the winter, so this rule would not apply as there is additional support holding the mug. Design. In regards to the design of a coffee mug, you want it to be comfortable around your mouth. This means that the cup should be wide enough so that it does not hit against the bridge of your nose or chin. The design should also be straight at the open top to prevent spills. Some designs flare outward, but often cause coffee lovers to dribble a bit. Enjoying that morning cup of coffee, after staying up to watch a favorite television show or sporting event is refreshing. An evening cup, after a hard day of work, is equally refreshing. By selecting the right type of coffee mug, the experience becomes better. 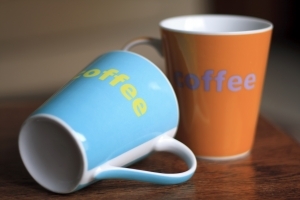 Some claim that coffee mugs with orange interiors make the coffee taste better. There is no scientific explanation of this, but some coffee lovers swear by it.